On Thursday, November 1, 2012, a day that I remember for many other reasons besides food, I happened to have the most amazing empanada you could ever imagine. At the time, I was enrolled in Journalism 301, a class that required me to travel into Chicago several times per week to report on my assigned community, Rogers Park. I was working on a story about the impact of Medicaid cuts four months earlier on people in the community, and of course I needed testimonial evidence from people in the community. There is so much I love about being a journalism student, from honing my writing skills to having the obligation to meet people and explore communities, but one thing I would rather do without is man-on-the-street reporting. It’s so intimidating. And factor in my requirement to go up to complete strangers and ask about Medicaid and most likely get on the topic of wealth and unemployment, and it’s no wonder I waited until the day before my story was due to finish this part of my reporting. That’s why I made a day of it. Or at least part of the reason. At the time, I was also writing each week for North by Northwestern’s entertainment section, so I happened to schedule an interview with a couple of actors from the Twilight sequel, Breaking Dawn: Part 2. There was a time in my life when I would have died to have that opportunity, but this wasn’t it. I was happy to do it, but mostly I was a little ambivalent toward that part of my day. What I was more excited for was the chance to escape to Chicago for the day. One of my biggest objectives that day, besides accomplish some reporting and succeed in my Twilight actors interview, was to track down a few food trucks. Most of the times I have ever eaten from a food truck, it’s because of food truck rallies at Northwestern in Evanston, not because I find them downtown at lunch time. Because let’s face it – I hardly make it down there so early in the day (unless I decide to skip classes, that is). Looking to keep it cheap, I chose to purchase two empanadas that afternoon. That was a tough choice to make. I asked the person in the truck for recommendations, and he told me two top sellers they had in stock at the time were the malbec beef empanada and the bacon, date and goat cheese empanada. Back then, the beef one was a no-brainer, but I was a bit more hesitant about the latter. I wasn’t super into goat cheese then (things have obviously changed since), and dates? Hmm. But bacon, I could do that. So I ordered both. I sat down on a ledge literally right next to the truck to eat my food truck goodies. The beef empanada was quite reminiscent of a pot pie, so it was a winner besides the onion strings inside. I wish I could make myself like onions – at least I’m making a tiny bit of progress with tomatoes. Then I made my way to the bacon, date and goat cheese empanada. The bacon gave the empanada dough a light, greasy sheen that required me to get my napkins ready, lest I would wipe my fingers on my jacket before going off to interview people. I sighed and took my first bite. That bite surprised me because I wasn’t expecting the empanada to be so sweet. Having just polished off the beef empanada, this one seemed almost like dessert, probably due to the sweet, dried dates inside. It took me a while to decide how I felt about the empanada. Still being a novice to goat cheese, the idea of cheese that came from goats’ milk did freak me out a bit, just because I have a crazy great aunt who has a herd of goats and a barn overflowing with goat dung. I was able to keep that out of my mind, however, because the mix of flavors was actually quite addicting. Sometimes I eat something with a tiny hint of some flavor I just want to taste more of, and I find myself continuing to eat it because I’m trying to taste this flavor. It’s this weirdly psychological reason for my addictions to Terry’s Chocolate Orange, fresh naan bread, very lightly salted tortilla chips and these empanadas. The bacon was so perfectly balanced with the caramelized dates and the creamy goat cheese that its light, smoky flavor was buried enough beneath the leveled dark, fruity and creamy tastes that I wanted to continue to take bites just to savor the combination and to search for even more bacon flavor. I’m always impressed when I eat something that keeps me guessing and searching like this, because it means there is just enough of that ingredient. 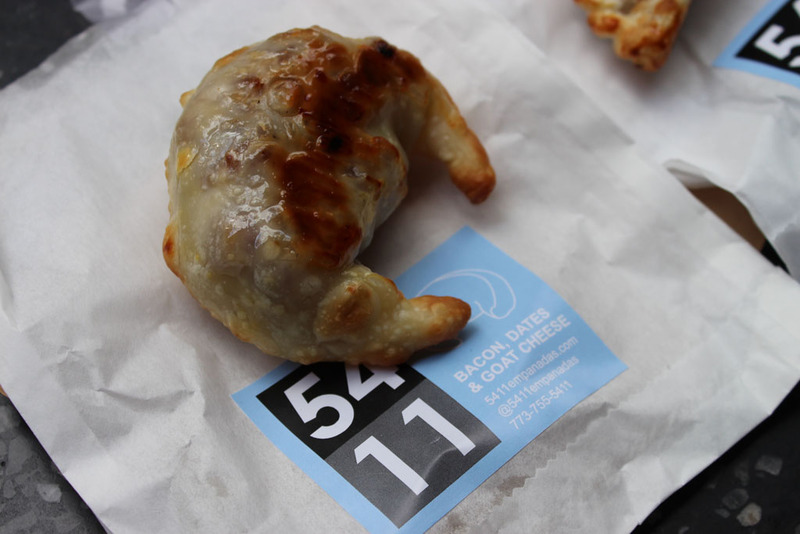 Nobody wants to eat a bacon, date and goat cheese empanada that is all bacon and little goat cheese, nor do they want a peanut butter and jelly sandwich with an overwhelming amount of jelly. Or at least I don’t. I was so happy with the flavor combination inside this empanada that there’s no chance I’ll think twice about ordering this very empanada the next time I stumble upon this truck. This entry was posted in Odes and tagged 5411 empanadas, bacon, Chicago, dates, empanadas, food, food trucks, goat cheese, journalism. Bookmark the permalink.